is a teen-powered, global health-initiative incubated at JSES International since 2014. The mission of theTeen Heart-Health Initiative is to share AHA-approved heart-health information with youth and teens around the world, with the aim to empower life-long heart-health habits and save as many future lives as possible, in the long-term. In March of 2014, JSES Founder Luca Pistor, was invited by Dr. Karol Watson MD, Dr. Tamara Horwich, MD, and Dr. Marcella Calfon Press, MD, to a UCLA round-table to discuss how JSES could share their teen-reach to build awareness of preventative cardiovascular health for teens. Inspired by the cardiologists, Luca and Kaycee co-founded the Teen Heart-health Initiative under the mentorship of Dr. Watson and her team. Luca brought the initiative into JSES Berlin 2014 and JSES Santa Monica 2014 to gather research and ideas from 50 JSES participants. At JSES Santa Monica 2015, Hannah Fogelmann and Alaman presented the initiative at JSES Santa Monica 2015 which garnered local support. Luca and Kaycee were introduced to LA's heart-health community at the UCLA Pauley Pavilion's 2015 Let's Talk event. Lara von Donnersmarck presented her Donners Market idea for farm-to-table produce boxes with a unique educational element, which received interest from a local family farm. 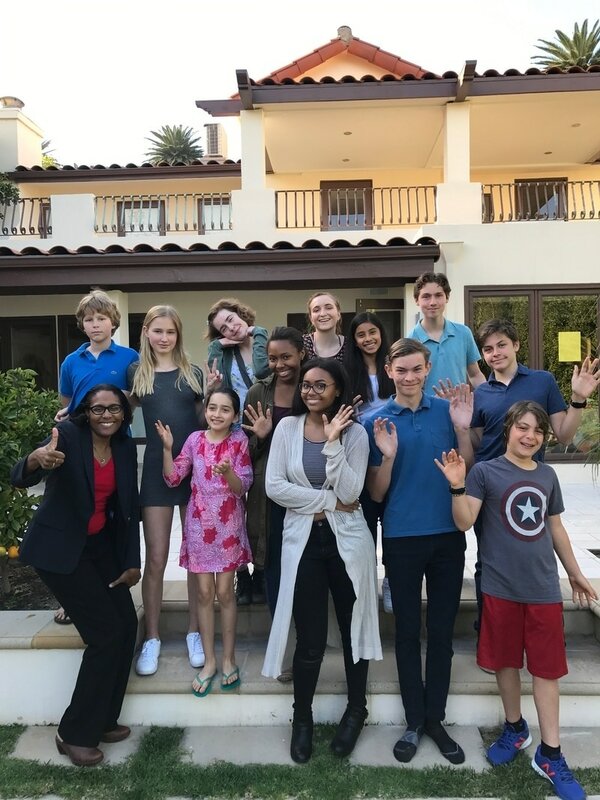 JSES Santa Monica 2016 hosted a Teen Heart-health Initiative round-table lunch with Dr. Karol Watson, MD, and Dr. Tamara Horwich, to create the Teen Leadership Team, where they brainstormed ideas and developed a music/media-project with professional musicians to roll-out in 2017. JSES Santa Monica 2017 hosted a round-table lunch with Dr. Karol Watson, MD, and heard the updates of funding by Dr. Gordon, and a web app that sends heart-friendly texts to teens and the JSES group brainstormed on how to support that project. Luca and Kaycee were given UCLA Heart Awards' Impact Awards. 1. Heart disease is the #1 cause of death in the U.S.
2. Teens DO NOT have access to updated heart-health-education to for their future heart-health. 4. Teens are under too much stress which is back for the heart, and need to learn de-stressing techniques. 1. Name it to tame it! We are the Teen Heart-Health Initiative and we take daily action. 2. Work with Dr. Karol Watson MD and team to gather updated data for teen heart-health. 4. Learn and teach de-stressing techniques to students, and get de-stress professionals into schools. The teen-reach of Teen Heart-health Initiative has surpassed 3,000. We are increasing our reach by visiting schools in LA, NY, Berlin, and Xi'an. A city-wide launch started this year and #TeenHearthealthInitiative is expanding on social media. Twice a year round-tables to check on our heart-health projects and teen reach program. Communicate THH through word of mouth, and JSES Santa Monica 2017 and JSES Berlin 2017 and Xi'an 2017, to get more teens on-board through school and community presentations*, through social media. SCROLL TO BOTTOM TO SIGN-UP! Its Free to join & participate! Benefits: Aside from heart-health benefits, you can attend our teen and youth events and get mentor-support for heart-health projects from university mentors! MORE: Whole fruits and vegetables, lean white meat, healthy fats like nuts, avocado and coconut. LESS: Additives, fatty meats, saturated fats, sugary and salty foods. NO: To reduce heart problems and lung cancers, avoid starting to smoke (including hookahs, e-cigs, first or second-hand), deep-fried foods, high-fructose corn syrup, trans-fats, MSG, artificial colorings and additives, sodium nitrates and sodium nitrites. MORE: 1 hour a day of movement from activities you like! Bike-riding, swimming, ping pong, dancing. Remember to get a cardio exam before starting your school sports program. Less: Sitting for hours without breaks. They say "Sitting is the new smoking". Walking or standing desks are good.